I'm so excited to share Everett's costume with you! It turned out just how I imagined but also SO MUCH BETTER than I expected! He's a bird. Just a generic bird. That's how he understands the creatures anyway, so why complicate the matter? I actually got the idea from Pinterest and specifically this blogger. I now know that she got the idea from someone else, but her project gave me the "spark!" 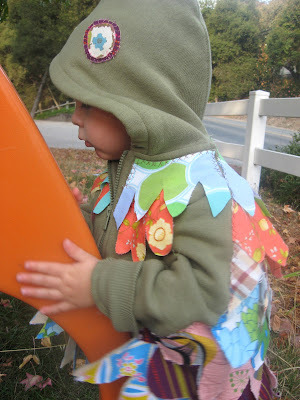 She made her daughter fabric feather wings that were just so adorable, and I thought they would adapt perfectly to a costume for Everett. The original wings were a cape that tied around the neck and wrists, but being that Everett is just 17-months-old, I didn't think he would quite understand ribbon choking him and grasping his wrists. I really enjoy building on a hoodie. It's a comfortable piece of clothing that simply fits over another outfit, so we can drive to Zoo Boo or to trick-or-treating in a normal outfit and then throw the hoodie on when we reach the destination. The only issue is if it's too hot at the end of October--which is a real possibility in California. 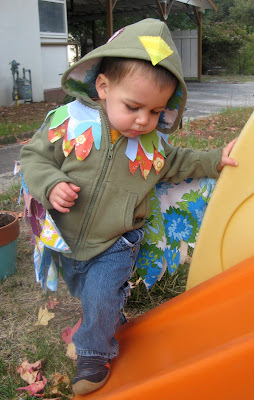 We made his costume on a hoodie last year, and it worked out great! We lucked out that we had a hoodie with ears already on it (bear ears?). We made him a porcupine! I'm saying "we" so much because Brian, my husband, helped me a lot more with that costume--since I needed it! Don't get me wrong, the porcupine was suuuuuper cute, but I think it's funny that we spent so much more time building the quills last year than I did making the wings this year. And I think I actually like the bird costume more! If you're interested, the felt quills are sort of like cones (triangles?). Not rolled, just folded and hot-glued. Then we painted the quills, stuffed them, then hot-glued them to the hoodie (felt and stuffing glued to the hoodie). Isn't hot glue the most wonderful stuff?!? I'm just remembering. Our hot glue gun stopped working the day before Halloween (or the day before Zoo Boo). Halloween is NOT the time to buy a new hot glue gun! My mother-in-law went to Michael's, and they were out! My mom saved-the-day by bringing over one of her extra guns! Haha. Funny memory. If you're interested, Brian "carved" those pumpkins with a drill with hole-cutter bits. You can tell how much I enjoy carving pumpkins. Blech! I think they turned out great! Back to the wings . . . I wanted to sew his costume this year, just in case he wanted to wear it over and over and we had to wash it (just wishful thinking on my part). I laid out the hoodie and traced the shape of a cape on a neutral piece of fabric. Cut it out. I then made pattern pieces out of paper that fit onto the fabric. yes, Everett needed to be involved. He's a very talented artist already. Here are the pieces (all but the smallest that I used to create new patterns for the feathers on the front of the costume). When I cut the fabric, I cut at least an inch, maybe an inch and a half, extra at the top. I realized that the stitching would show if I made the pieces this thin. I would have used tracing paper if I had it, or had it in big enough sheets. I machine sewed the strips to the cape, starting at the bottom. Each strip covering the stitching of the previous line. I trimmed the neural cape then cut another cape to be the backing. I didn't really need to line it, but by lining it, there's color when he lifts the wings. Also, the backing has bottom feathers, which the neutral cape didn't (does that make sense?). The backing (lining, whatever) doesn't exactly match up with the bottom feathers (it's a stretchy fabric, but so feather-y!). But it doesn't matter because it just makes it seem layered. I was very lucky we had a wedding to go to in northern California last weekend. Brian drove the whole time, and I was able to do the hand stitching. I vote for a road trip every year the weekend before Halloween! I was able to finish the entire costume! I wanted to hand stitch the visible bits. Since I didn't plan to finish the ends of the "feathers" and let them fray, I wanted to encourage the "folksy" nature of the outfit. I did blanket stitches for the eyes and beak and cross stitches for the wings. I was proud of my creativity with the eyes. They're actually flowers on a fabric I really like, surrounded by a darker fabric. I had no intention of lining the inside of the hood, but the hoodie I found had camouflage inside the hood, so I had to cover it! I really like that extra touch, and I never would have thought of it on my own. Thank you makers of bellicose children's clothes. You're an inspiration! Ha. I'm very happy with the result. I think it's beautiful, and I'm very gratified that Everett knows it's a bird costume and makes "caw caw" sounds when he wears it. I really wanted him to be something he understood. Thanks to my best friend Rachel who let me pilfer her fabric stash. I don't have much of my own yet (although a few were mine--including a piece of my dad's old flannel shirt! ).